This would be my first blog for a puzzle by Radix, and I approached it with a certain amount of trepidation. Why? Well, his last Listener (3993, Argentum) had me stumped, with its tortuous Playfair, and his last EV (745, A1 Etc), had me equally stumped! Not a good batting average (if that’s a suitable comparison). I solved both parts of 1ac and the first parts of 5ac and 10ac. I arbitrarily put ENGUARD in the left hand diagram (from now on called grid A, the other B), but time would tell whether I would get a conflict because it was in the wrong one. At this stage, I wasn’t even sure that the clues to be discarded would form a second complete grid, but it did seem likely, especially given the title. But where to put 10ac AHAB? It seemed logical at this point not to do a complete pass of all the clues, but to concentrate on the top left corners and work out from there. The second part of 2dn was ALEE (with the H of SHEEP the rogue letter), which meant AHAB was in the left diagram. I always mark the division in clues of this type as it makes the checking easier later on. 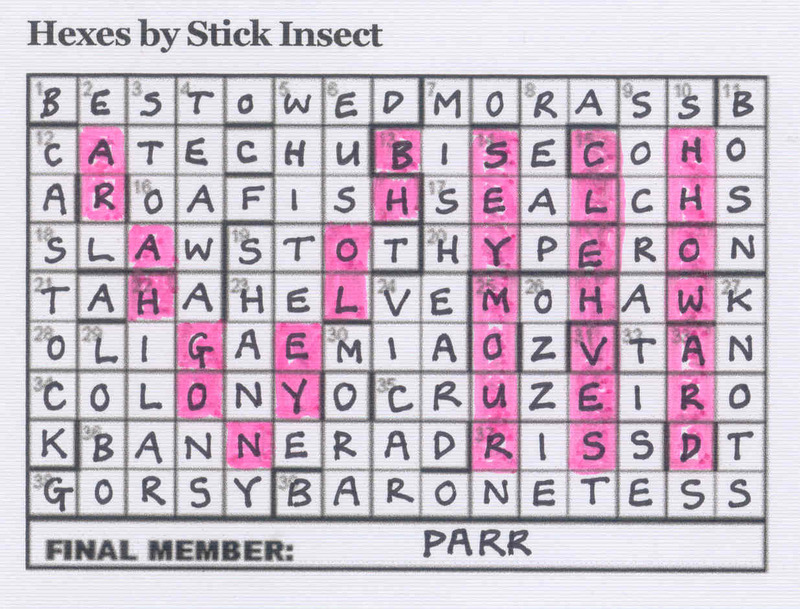 In this case, I also marked whether the clue had an extra letter (+) or was missing one (−). I must say that things moved along fairly quickly for a bit. I took a chance that 11ac PAROLEE would be in grid A since it crossed 7dn ALSO and meshed with 5ac. Getting B-1dn PORTHOS (Rio for trio) spurred on grid B, and 16ac HANDSELS all made it look a bit more promising. A-5dn was EPEIRA although I couldn’t make sense of ‘that clown’. It was only when I got APOGEE that I realised that it was referring to the clown (APE) used in the first part of the clue. In fact there were a number of clues that needed a lot of thought to understand, especially before the message in the clues was revealed. And some of those rogue letters were indeed devious little pests: long due for long dune; It turned up for I turned up; after 5 am for after 5 aim; and bias among for bis among. All in all, some of the later clues were quite a slog (in the nicest possible way), even the four-letter ones. And one of the disadvantages of not having a first pass through all the clues at the outset was that I came across clues after about three hours that I hadn’t seen up to that point. Oh well, I was gradually getting there. I suppose I was three-quarters of the way through the grids when I decided to look around the grid for anything hidden. Given the Double Cross title, the diagonals seemed a good place to start, and there was THESEANSW… in the main NW-SE diagonal of grid A. So that gave me THESE ANSWERS followed by SHOULD BE USED running SW-NE. Et voila, in grid B we had PLEASE IGNORE and THESE ANSWERS similarly placed. This did help with the last few entries, and the cautionary message was fully revealed as YOU MAY NEED TO CONSIDER THE OTHER CLUES INSTEAD. The only thought I had at this point was: How do you know what clues I had considered? This led to the horrible doubt that it all might be a bluff, after all the title was Double Cross! In the end I decided that that would be too sneaky, even for Radix. An excellent puzzle from Radix, and hopefully a successful one for me, although I think Radix has beaten me more times than I him. What a good thing that it was a miserable, bitterly cold weekend here in the Alps, otherwise the ‘Black and white horse (5) Z?? ?A’ team might have objected to spending most of Saturday and Sunday tussling with Radix’s wordplay – and then much of Monday debating his logical time bomb. We have painstakingly broken down all those obscure clues and produced two grids. Great. Put one in an envelope and mail it. But hang on a minute – which one. 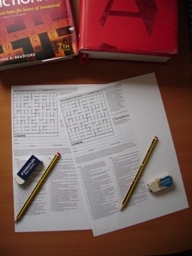 One has clues that read ‘These answers should be used’ in the first of two crosses. Yet below it I find an alternative, ‘Please ignore these answers’. Now this is a binary situation: an alternative has equal value to an original, it doesn’t override it does it? below? These answers should be used. Dilemma! Ah well, those extra letters will surely resolve it. 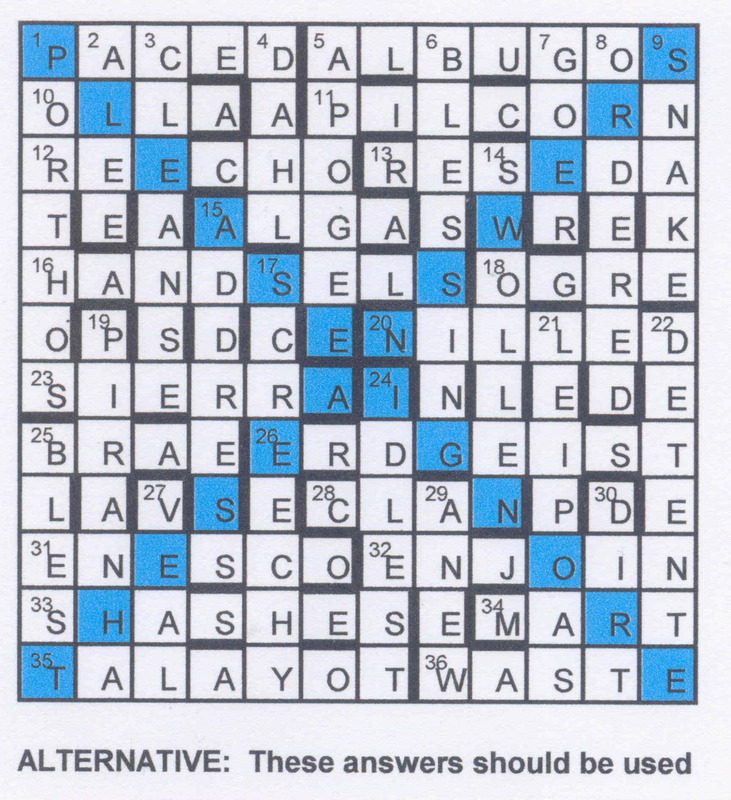 What do I find (carefully checked so that I have ten letters included and ten removed in both the across and the down clues). ‘You may need to consider the other clues instead.’ Ha, that solves the problem – but does it? Which were the other clues – how can he know which I was considering first? I can see that this discussion can go round in circles forever. I wonder what would happen if I put my original grid in an envelope and sent it. After all, I rather naively worked on a single grid for about two-thirds of my solving and then realized that the clues were actually splitting themselves into two completely separate grids. Of course it made sense to work on two grids, since that automatically gave strong prompts for the missing answers instead of the jumble of letters that had confronted the bemused Stripey Horse team. I suppose that is another lesson that experience is teaching us! All day Saturday and Sunday? What about Friday evening? Well the Z??? ?A team abandoned in despair and decided that this one had defeated us as we could rarely decide where the half clues started and ended. ORRA, MART and SAUTERNE (yet another oenophile Radix?) – we didn’t even reach our aim of 12 clues on a Friday and this one had 80, not 40 to solve! Only the knowledge that Radix was behind this fiendish puzzle and that, therefore, every scrap of wordplay and every comma and semi-colon was going to be justified, kept us slogging on. Some magic moments: (20a would not tramp once home – after whee(D)ling) we find that NILLED was an old form of NOULDE or ‘would not’, so we look up DELL and find that it fits the definition of ‘tramp; (17d Rat in a state in washing liquid) we put a likely ‘state’, VA, into ELUATE and suddenly understand that we have EVALUATE or RAT(E). Slowly we tease out those extra letters and can guess at ‘You may need to consider the other clues instead’. I believe there is a limit on the length of blogs. It would take several thousand words to work through our cursings, mumblings, red herrings and muddy garden paths. Suffice it to say that it was noon on Sunday before the notion of separating what we had into two grids shed a little light into the gloom. 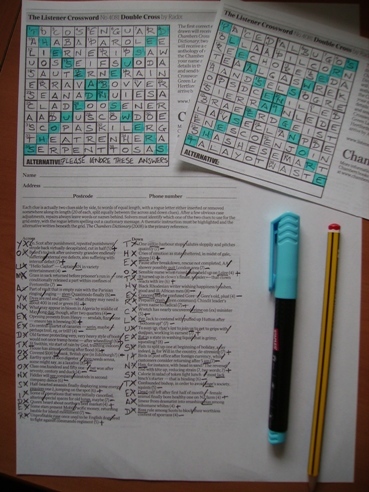 The TOCOS grid was easily completed and THESE ANSWERS SHOULD BE USED appeared. (That was a good thing as this grid was certainly easier to fill.) One cross obviously led to the other ‘PLEASE IGNORE THESE ANSWERS’ – a relief, as we had lots of gaps. However, with zebra stubbornness, (and help from our gifted solving friend) we completed the grid we hope we have to discard. But who would opt for SIERRA from the clue ‘S(T) Swithin, viz start of rain by God trashing indoors?’ OK: We trash ‘within’ (indoors) and we are left with two Ss, so one of them is the S of the International radio code words (Alfa Romeo, Golf, Porsche and whatnot) and gives me SIERRA as our definition; I have an S left, viz gives us IE, Rain starts with R and we need the God RA – SIERRA! I had trouble with OLLA, as I thought that it was only the equivalent of OLIO in the sense of a stew – can it really be a variety entertainment too? There were dozens like this for us and a number of new words – SEREIN, SHASHES, PILCORN, NOCKET, TALAYOT, LEIPOAS, ALBUGOS. Does Radix use these in everyday conversation? Well, perhaps we will from now on. One thing is sure, after probably about ten hours of struggling, our ability to handle wordplay must have developed. Many thanks, Radix, for stretching us to our absolute limits! We just hope you never get to a triple cross! The extra and omitted letters spelled CATH(H)ERINE A(H)NNE JANE AN(H)NE C(H)ATHERINE CATHERINE. These were the six wives of Henry VIII, with four of them “interrupted” by an H (for Henry), namely the four whose marriages were ended prematurely. For Catherine of Aragon and Anne of Cleves the H was central, which I think was supposed to represent a divorce (although properly speaking these marriages were ended by annulment), and for Anne Boleyn and Catherine Howard, the H was second, beheading the initial letter. Jane Seymour (who died) and Catherine Parr (who survived Henry) were uninterrupted. 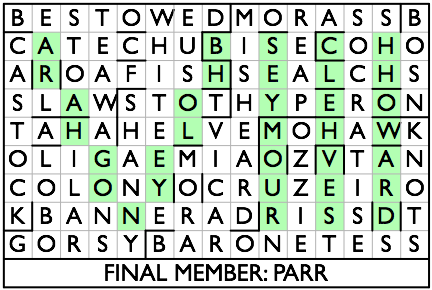 There was the usual trap for solvers having trouble with wordplay at 12d, where both CASTOCK and CUSTOCK fitted the grid and the definition. A very similar theme was previously used in Listener number 3728, Who Am I? by Amicus. And that’s it from me. 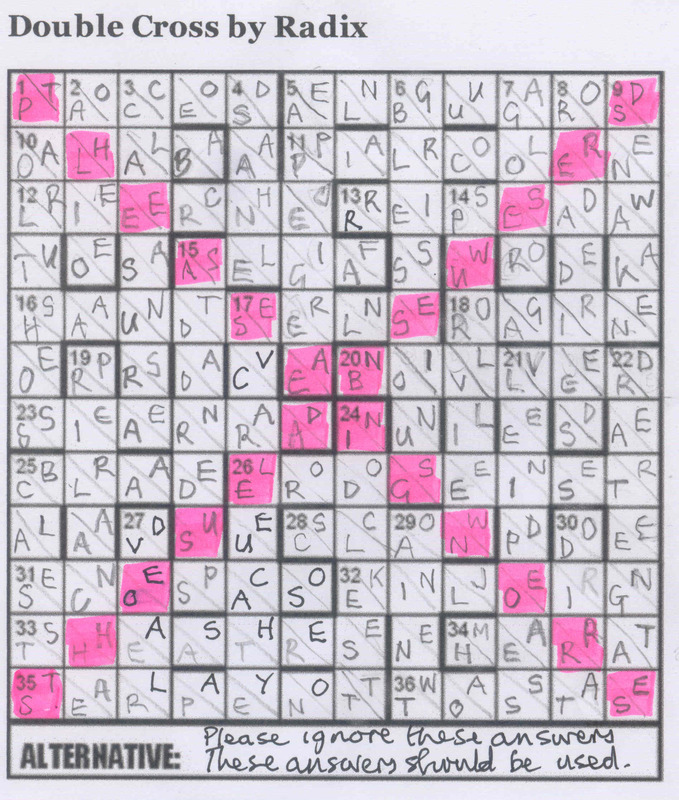 I’ve enjoyed writing about these puzzles, and who knows, perhaps I’ve inspired someone to have a go. I’ll leave you in the capable hands of Shirley Curran, Erwin Hatch, Dave Hennings, and the other Listen With Others contributors. The Dumbos were hoping for a slightly less challenging crossword than last week’s stunner – and we got it. What a wonderful feeling it is to be able to start solving as the printer rolls out the grid and to continue steadily until the grid is full on Friday evening. What was even more thrilling was that a familiar set of names seemed to be appearing along the edge of the clues, though what the extra H kept appearing for, we didn’t really understand. Soon, we were chanting that old school mnemonic (I wish someone would give me a mnemonic for spelling that word!) ‘Divorced, beheaded, died, divorced, beheaded, survived’ and there were three Catherines, two Annes and a Jane. Two solutions left me puzzling. MORASS at 7ac was the only word Chambers offered that fitted the definition of ‘a risky situation’ but it wasn’t until Saturday morning that I followed the trail in Chambers to find that MOR is a version of MAUTHER for a clumsy big lass up in the north. That confirmed REAP which didn’t seem to fit too well with the definition ‘to win’ but I finally realised that PATER was standing up and losing his T. Aaah! It was a good thing for me that there were no unches in that corner. I imagine that Stick Insect got away with that because of the nature of the material that had to be fitted in. Just some highlighting left before the weekend loomed empty of crosswords except for AZED’s challenge on Sunday. There was an ANNE lurking in the south-west corner, but no Catherines at all – just a CAT up at the top – so that wasn’t it. It had to be HOWARD, SEYMOUR, CLEVES, BOLEYN and ARAGON – and, sure enough, there they were, with the shorter names conveniently interrupted again by H(enry). Final pdm! The H exes are Henry’s exes and, of course, Catherine Parr wasn’t exactly that, so she gets a little slot of her own. Nice! I had a very pleasant chat with Dave Hennings over breakfast last month, the morning after the annual Listener dinner in Chepstow, and I promised him a setter’s blog for my soon-to-appear puzzle (which, pleasingly, was scheduled by the Listener editors to appear on the anniversary of Beethoven’s death). So here it is. The germ of the idea for Sine Qua Non happened quite quickly. I knew of the connection between the opening motif of Beethoven’s Fifth (V) and the Morse code for V (something that was exploited in BBC broadcasts during the war), and I was idly wondering if there was enough traction in this for a puzzle. Looking at the anagrams of ‘   ’ gave me L,B, and F, and I immediately saw the possibilities of LvB. Turning to ODQ, I saw the wonderfully succinct “MUSS ES SEIN?” quotation associated with the F major string quartet, and I knew I had a puzzle. The following gradually emerged from the initial idea. There would be a Morse code message embedded in the clues somehow. There would be some hint to discover the Morse code connection between L,V,B,F and this would lead to LVB and F-major highlighted in the original grid. There would be a morphing of the F-major quartet to the Fifth symphony in C minor, and the final ‘rendition’ would at show DIT-DIT-DIT-DAH. As DIT-DIT-DIT-DAH would be glaringly evident in the final grid, I also wanted to disguise it a little bit to lessen the possibility of arriving at the solution without fully understanding the theme. The details took many months to work out as I explored a large number of ideas. Unfortunately these ideas are sitting unrecoverable on a crashed hard disc, and as I actually worked on the puzzle about three years ago (I remember starting work on it around the time of the Listener dinner in 2007), many of those ideas are long forgotten. I do remember that I had discarded around 25 different grids/fills by the time I arrived at an approach I was satisfied with. Some of the main details I had to work out were (a) how to render the Morse code, (b) how to indicate that all four anagrams of ‘   ’ played a role, (c) how to disguise the DIT-DIT-DIT-DAH, (d) how to reinforce the fact the final grid would be rendering Beethoven’s fifth, and (e) what exactly should appear in the final grid. I tackled (a) first, and for a long time I was fixated on the possibility of using various combinations of dashes, full stops, ellipses, colons, and exclamation marks, with an instruction to look at the (possibly rotated) punctuation. In the end these ideas seemed too complicated, and I discarded them when the much simpler idea of representing the code with dots from “i’s” and the dash from the “t’s” occurred, especially since the hint “DOT ONE’S I’S AND CROSS ONE’S T’S” was verbatim in Chambers. Also this phrase had a good length, corresponding to the number of across or down clues one might expect to have in a thematic 13×13 grid. As the phrase was somewhat oblique, I needed to give a further hint about the Morse code, and I came across the delightful ‘IDDY-UMPTY’ which was short enough to leave the appropriate number of clues for holding the Morse code. As the clues turned out, the misprint for MAGS in 1D was ambiguously E or I (a known but not deliberately-crafted ambiguity) and, in a personal communication, I was amused to find out that one solving team, in attempting to unravel the code, had somewhat optimistically searched the internet for a person named Eddy Umpty. Given that some clues were going to be holding hints relating to the Morse code, and the remaining clues would contain the code itself, it was clear that the preamble would have to provide the instruction about the four anagrams of “…-“ and their role. The preamble caused a fair amount of comment in the feedback I had – “Why not institute an annual award for the most impenetrable preamble?”, and “a preamble that initially makes one want to lie down in a darkened room, but all makes sense in the end”. Although there is a risk that a complex preamble puts off would-be solvers from tackling a puzzle, my feeling, shared by several solvers, is that the gradual enlightenment that occurs as layers are peeled off adds to the solving enjoyment, so I make no apology for it. 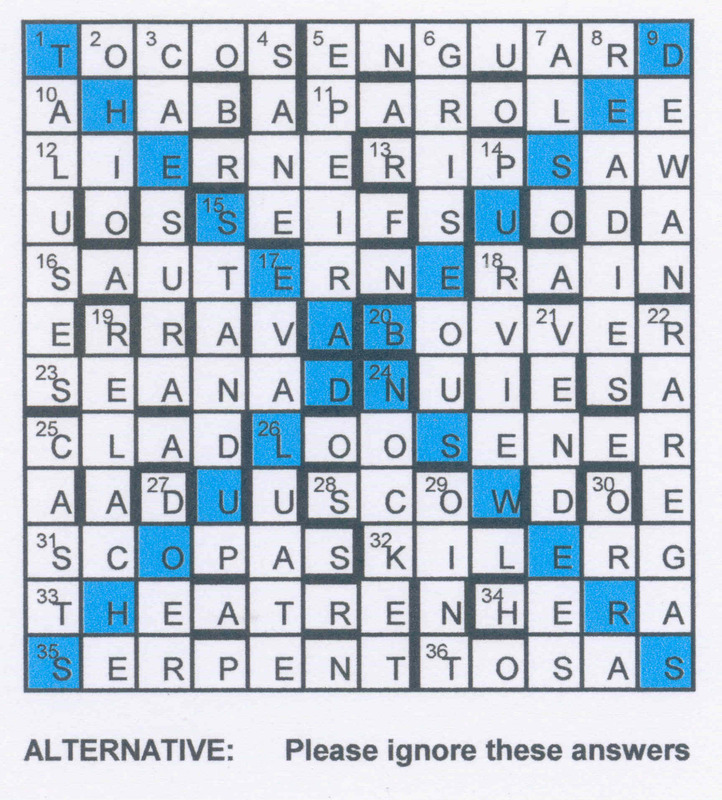 It was one thing that delayed the appearance of this puzzle for quite a while, as the Listener editors were worried about the complexity, and suggested some improvements to it which necessitated an additional round of test solving. I wanted a more explicit way to validate the connection between L, V, B, and F, and, searching in Chambers, I found the apposite PAEON. This allowed me to kill two birds with one stone, as I could position PAEON prominently in the middle of the DIT-DIT-DIT-DAH thus disguising the denouement, and position the replaced letters diametrically opposite. This, in principle solved (b) and (c) if I could find a way to show the transformation. The term DIAMETRIC EXCHANGES was the most accurate hint I could come up with that would fit in the ‘normal’ clues, and it gave me the opportunity to emphasise the V=Fifth symphony connection by hiding the message in the 5th letter of the 5th word, thus solving (d). –	Reasonable average entry length. Of course the steps above didn’t occur in strict order – any set of ideas has to be validated for feasibility by constructing trial grids, and testing out if clueing devices are workable. As the grid and fill started to take shape, I noticed that the key LIVEBOX and A MAJORI entries used some of the rarer letters, and I wondered if I could make the original fill pangrammatic, something I was able to do without too much extra work. I was especially pleased about FONE with the F giving the key of the original, as it forced understanding of the theme, with A ONE, BONE, CONE, DONE, GONE, and even HONE (in German notation) as possible substitutions. I take a long time to write clues. I like to get a full set of clues written initially, and then I chip away at them one by one over several weeks or months, picking in turn what I consider to be the weakest, and looking at other ideas until I’m satisfied. In the end I usually end up overwriting most of my original clues. I was in my element for the ‘misprint in definition’ clues, this being my favoured device, but the Morse code/5th letter of 5th word clues were very tough – apologies for the unavoidably otiose treatments in one or two cases. Finally, the title. I did consider ‘H’ (Beethoven’s Fifth) as being a confirming title, but I thought that this might lead to some ambiguity earlier in the solving process, given that four other single letters were in fact the key to the puzzle. In the end I went with a thematically paeonic (DIT-DIT-DIT-DAH) title that resonated with Beethoven’s answer to the original question, and hopefully also served as an answer to the questions and complexities raised by the preamble. Many thanks to all who have taken the time to provide feedback, either via John Green, or on the message boards.